The roles and functions of the Mayor are set out in the Municipal Structures Act. The mayor is elected by the Municipal Council to co-ordinate the work of the Municipality. 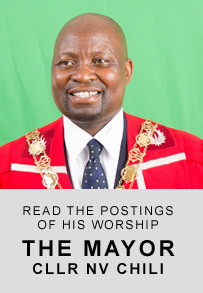 The Mayor is the political head of the municipality and is expected to provide the required leadership necessary to keep the municipality moving in the proper direction. The mayor presides over meetings of the Executive Committee and performs functions assigned to him or her by the municipal council or the executive committee. These duties include any ceremonial duties. The Municipal Manager is directly accountable to the mayor. The mayor appoints the municipal manager and heads of departments upon resolution of the council. One person may serve a maximum of two consecutive terms as mayor in the same council. Umsebenzi uqale ngelikhulu isasasa kanye nesivinini. Inhloso yethu ukuthi umsebenzi wenzeke ngendlela encomekayo. Into yokuqala esayenzayo ukuhlalisa siphinde sikhethe amakomidi, inhloso yalokho ukuthi sigcine umuntu nomuntu ekwazi ukuphendula ngekomidi lakhe.